This isn't the kind of meeting where you want something and the other person knows you want that thing. 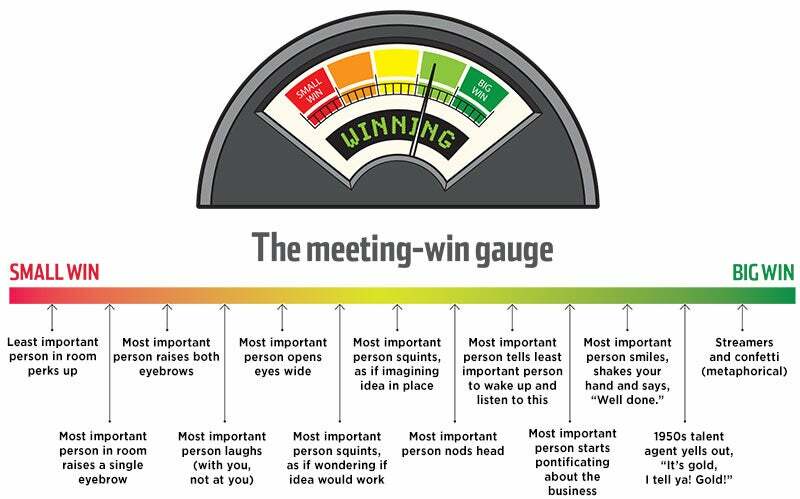 This is about a meeting in which you are the only one who knows you're trying to win. It's a secretive thing. You have an idea you know you want to share; nobody but you knows you want to share it. And you need to try to share it at the right time and with the right measure of enthusiasm. The hope is that your idea will seem like a brilliant gift. Because these types of unsolicited ideas often just fizzle. We mistime their introduction. Or we misgauge the climate in the room. Or we don't couch it in the right way. So, how should you approach this? How do you get your point across without being overbearing and overzealous? How do you win a meeting when nobody else even knows there's a game afoot? Studying persuasive tactics in meetings was a key part of research conducted by Cynthia Rudin, associate professor of statistics at the Massachusetts Institute of Technology, and Been Kim, an MIT Ph.D. candidate. They found that it's possible to predict how an idea will be received by studying the language used to deliver it. Proposing an idea that agrees with what has been said in the past usually leads to a "Hell, yeah!" from all parties. In fact--and really, this is true--proposals that include the word yeah tend to do well because they show agreement with other people in the room. This is the key bit of etiquette of a meeting (and, frankly, anything involving working with people): acting like you're on a team. For what it's worth, here's a full list of words that Rudin and Kim found to be associated with persuasiveness: yeah, give, menu, start, meeting, touch, discuss, find, market, yellow, work, good, fruit, logo, people, side, number, presentation, things, chip, stick, gonna, information, talk. Now, back to your little secret: Your idea may be accepted on its merits, but that acceptance will be curbed by suspicion about just what it is you're up to and what team you're really playing for--the team or your team (i.e., a team of one). The key to keeping the team stink eye at bay--and to prevent anybody from leaving a "There's no 'I' in team" mug on your desk--is graciousness. Even selflessness. The key is to let others' ideas be the context for your own. Says Rudin: "I don't think there's anything you could do to truly ensure that you're going to 'win,' but at least you can increase the chances by understanding [your peers'] goals and framing your suggestions as agreements." Daniel Putterman, co-founder and CEO of online storage service Pogoplug, says another crucial part of presenting an idea is the preparation you undertake before walking in the room. "An obvious component of any meeting is knowing what you want," he says. "That's the easy part. What's substantially more critical is knowing what your counterpart wants." The key is learning as much about the company and the individuals in the meeting as you can. "I think people underestimate the power of that," Putterman points out. "You're saying, 'You are important to me.'" And if you're saying that, you're saying, "I agree." You agree that this is a team, and that good things are going to happen. And you agree that your idea is but one good idea in a landscape of good ideas. So, you've set the stage. You've established the context. People are listening. They've been flattered by your attention and agreement. The tough part's over. They're on your side. They're ready for the idea. All you have to do now is say it. Sit back down and seem vigilant, attentive. This suggests respect for all other ideas being floated, so your idea will be couched in respect and will elicit more approval because of it. No interrupting anyone in order to voice your idea. If your idea does not pertain to the subject at hand, do not voice it. The most compelling ideas seem to serve everyone in the room. Or better yet: the business. An idea should be framed as an agreement with ideas already floated. It should put you on the side of the collective. Never "float" an idea. Launch it, push it into the stream, yell at it with a bullhorn until it scowls at you. But don't float it. If an idea is merely floated, then it appears to be dead in the water, even if it's good. Anticipate three different challenges to your idea. And have answers ready. That's a great point, Kyle. You made me think about another approach. I like what Kyle said. Here's something else along those lines. Your idea should not be a caboose.